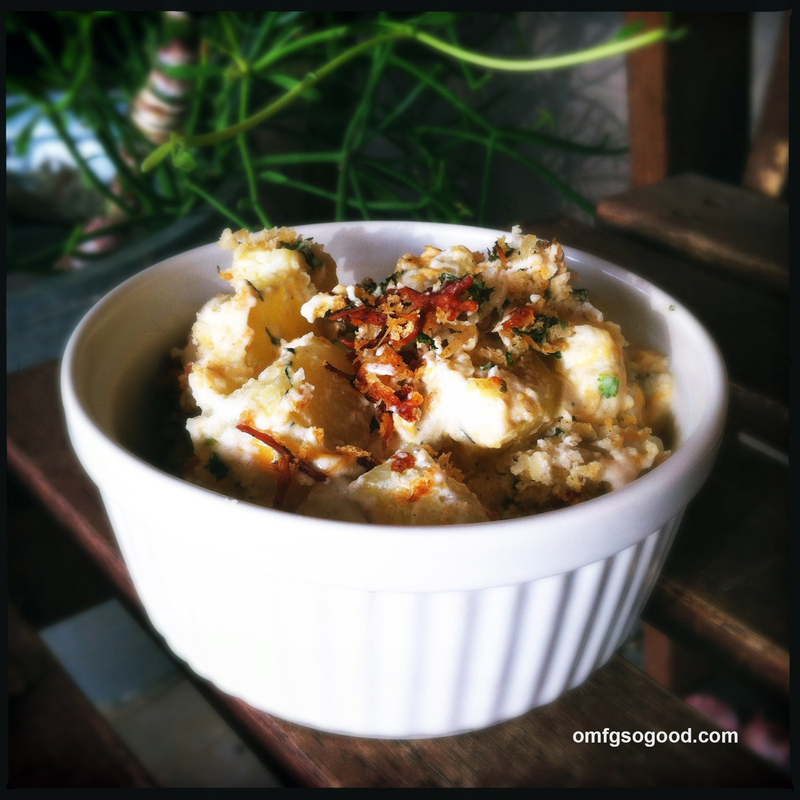 baked potato salad | omfg. so good. 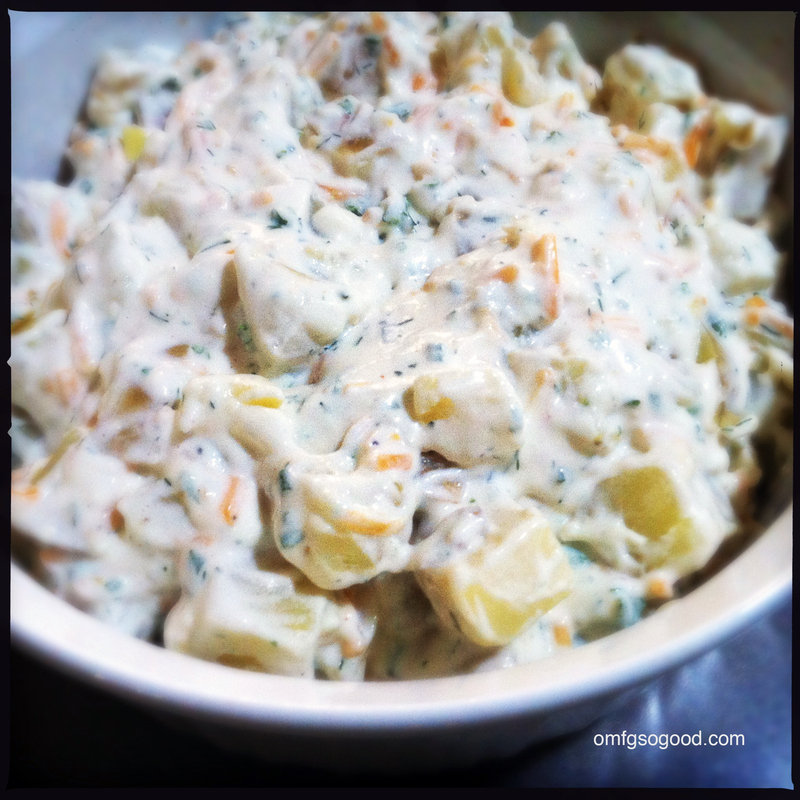 Who says you have to stop eating potato salad when the weather starts to chill? Not when you can make it with buttermilk, cream cheese, fresh chives & dill then bake it topped with crispy Panko and salty Parmesan. Preheat oven to 425 degrees. Boil the potatoes in salted water until fork tender, but not overly done (12 – 15 minutes), then drain. In a medium mixing bowl, combine the cream cheese and buttermilk and mix to combine. Add in the cheddar cheese, chives, parsley, dill and cayenne and mix until smooth and creamy, then season with salt and pepper. Add the warm potatoes and toss to coat. Transfer to a casserole dish and set aside. To prepare the topping, combine the Panko bread crumbs, Parmesan and paprika. Season with additional salt and pepper then sprinkle evenly over the potato mixture. There aren’t many things that are completely consumed by the next day in our house. We’re food snobs. We eat the first day, with every good intention of finishing off left-overs the second day (a task that’s usually assigned to Baby Daddy because I’m admittedly a WAY bigger snob than he is), but more often than not they just keep on leaving-over well into day three and/or four. Not. This. Stuff. It’s that good. Bake some up with a roasted pork tenderloin and you’ve got yourself a comfort meal worth writing home about. Delicious topping and I love the idea!